Planting Depth: Give Your Tree the Flare it Needs! Have you ever noticed a tree that looks like a pencil stuck in the ground while walking down the street? Here in Madison these trees are not hard to find, just try looking around next time you are out walking around. But how many trees in the forest look like pencils stuck in the ground? None. They all have formidable root flares, where the trunk gets wide and meets the soil line. From that soil line to 12 inches down is where you will find most tree roots. The roots stay close to the surface in order to facilitate oxygen exchange essential for the tree’s survival. This is how a forest-grown tree looks. Note how the trunk flares to the roots well above the soil line. Now imagine throwing a 6” layer of soil over the top of the forest floor, drastically cutting the oxygen supply to the trees. This is essentially what happens when we plant trees too deeply. Not only do we cut off most of the root system (to facilitate transport and planting) during the digging, now we stuck the tree in the ground too deep to get the necessary oxygen. Good luck arborlito, it's going to be tough! The following discussion addresses planting depth and what to look for when you are doing it yourself or reviewing others' work. I have no problem looking over someone’s shoulder when we are talking about the future of our urban canopy. Please read this and other discussions on tree planting to get a full and comprehensive understanding of how to complete the task correctly. I’m trying to emphasize the most important step of planting here, planting depth. When planting with b&b (balled and burlapped) or container sapling stock, the first step is to locate the root flare (where the trunk get wider, near the bottom). Don’t assume the root flare is just below the soil surface; I have found flares as deep as 8” below the soil line in some balled and burlaped trees! Once you locate the flare, dig your hole accordingly. Please remember not to dig too deep! If in doubt, err toward making the hole too shallow. Carefully place the tree in the hole. We almost always remove the entire basket and burlap material, but this takes practice and care. If you want to remove everything, just make sure not to disturb the root ball, as you don’t want to loosen the soil around the roots. If the root ball is already pretty soft or loose, don’t take the basket off. 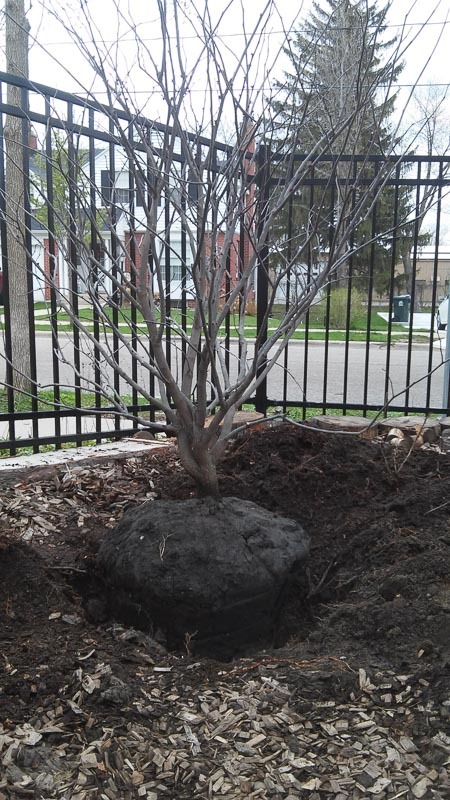 NO: The "pencil in the ground" look - a result of planting a tree too deeply. YES: Proper planting depth makes trees look like this in the end. Now you are ready to skim off the excess soil to expose the root flare. I like to use tools intended for other purposes here. My favorite tool is hand pruners for peeling soil away, maybe because I always have one nearby. Be careful not to skim off the bark of the roots; you won’t kill the tree if you do some light damage, but no damage is, of course, ideal. If the soil is really hard and difficult to remove, try adding some water. Spraying SOME water might help loosen the soil a bit... at a minimum you will get really dirty and appear to be working hard! Now you are ready to backfill the hole, making sure not to cover the flare with any soil or mulch. 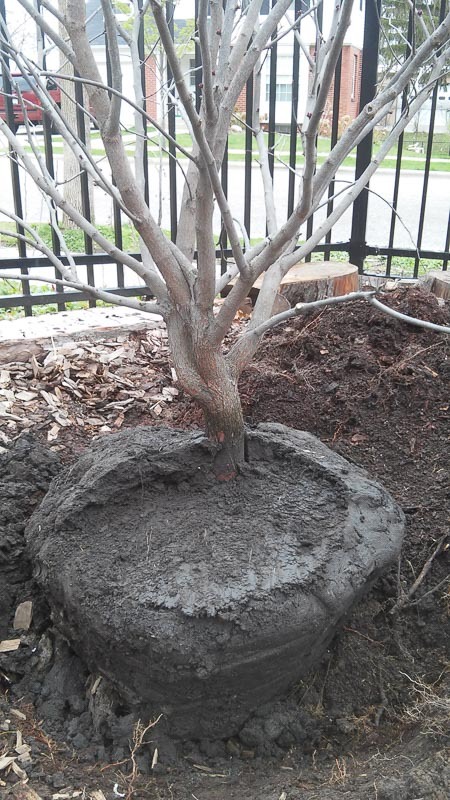 Put down a 2-4” layer of mulch around the tree, right up to the root flare. Continuous mulching, year after year, tends to build up around the trunk, so keep the flare clear of soil and mulch as time goes on. Correct planting depth is crucial for long-term vitality and healthy trees. Planting trees too deeply leads to many issues, such as decreased growth rates, slower establishment after transplant, girdling roots, and ultimately a tree removal bill due to the shortened life span. Give your tree some flare, and your attention will be well rewarded. We think the tree looks better like that anyways!